Preview: STEM challenges with a princess theme that includes FREE challenge cards. Just add your own STEM supplies. My girls can't get enough STEM (science, technology, engineering and math) activities - building, creating, designing. They love it and I love watching their creativity. We had so much fun with our Zoo Themed STEM Challenge that I decided it was time to do a similar challenge, but this time with a princess theme. My girls love princesses so I knew this would be a fun STEM challenge for them. 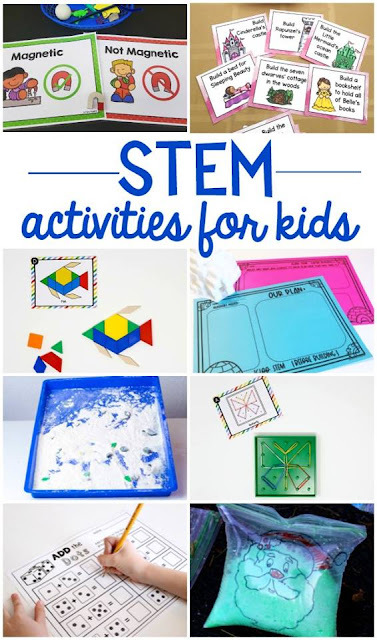 My favorite part was that we only used STEM supplies we had in the house, making it a free STEM activity for us. **NOTE: Use any STEM building supplies that you like or already have on hand. I just picked a few things from our STEM Bins (see more about STEM Bins here) and our crafts supplies so that I didn't have to buy anything new. Do what works for you! To set up our Princess STEM challenge, I put our supplies in our divided container. Then I printed out the challenge cards and cut them apart. I read each challenge to my girls. My oldest is my organizer so she separated them by princess before she decided what challenge to work on. They each picked a challenge card to start with. I showed them all the choices of supplies. I told them they could use them anyway they wanted, but I showed them a few tricks like using playdough to hook popsicle sticks together or using toothpicks to connect the foam balls. Then I just let them build with no restrictions. If something wasn't working, we talked about what else we could try. At first, my youngest (3.5 yo) was more interested in playing with the playdough than building anything. But she got into it and created a flat version of Rapunzel's tower. My oldest (5.5 yo) started out with Little Mermaid's ocean castle. She was on a roll but then was having a hard time making it taller without the sticks (under the weight of the playdough) falling over. She scrapped the idea and worked on building a floor for the castle. Then, she used the small cups to build walls around the floor so all the princesses could have a party. She got frustrated a few times because her arm kept bumping the castle and knocking down parts of the wall. She finally got it built and all the princesses and their pets played in it! Love her creativity. I LOVE STEM challenges because they allow my girls to build and create and use their imaginations. It also stretches their thinking as we troubleshoot when things aren't going right and try to come up with other solutions. I love that this was a free STEM activity since we used things we already had in the house. My girls love everything princess so this was a perfect STEM challenge for them. Would you like a FREE set of Princess STEM Challenge cards? Keep scrolling to the bottom of this post for your freebie. Looking for some more STEM activities for kids? Check out some of these awesome ideas! Ready for your STEM Princess Challenge?Just click below, enter your information and they will be emailed to you right away. Enjoy and tag me on social media (@sarajcreations) so I can see your Princess STEM projects.